Fresh kiwi, agave and a bit of water. That’s all there is to this exceptionally refreshing kiwi agua fresca. Kiwi is a fruit rarely seen anywhere but a fruit bowl, but you’re guaranteed to look at them in an entirely different light after trying this! Combine all ingredients in Magic Bullet and blend until smooth. Save this for a warm, sunny day and enjoy! This Memorial Day, I was so excited to see boxes of bright red cherries stacked up in the fruit section of my grocery store. I brought home a box and made this cherry pie smoothie, which includes fresh cherries, graham cracker crust, vanilla yogurt and milk. If you don’t have the energy to make a cherry pie (if you’ve made one before with fresh cherries, you know the amount of work involved in pitting the cherries one by one! ), you can quickly make a batch of this cherry pie smoothie and serve to your loved ones or enjoy yourself. Top it with fresh cherries, whipped cream and graham cracker crumbs for a sweet treat. Smoothies are always satisfying and (usually) extremely healthy. What makes the unhealthy ones so unhealthy? They’re often fruit-based and loaded with unnatural sugars and preservatives. Where do vegetables fall into the equation? Should we be scared to mix them in with their sweeter cousins? This green smoothie features a blend of kale, spinach, cucumbers and celery, combined with some of our favorite fruits to create a healthy, veggie-packed and nutrient-rich glass of satisfying goodness. Need we say more? Chop apple, pear, banana, celery and cucumber. Combine in Magic Bullet and blend. Add kale, spinach, and water. Blend thoroughly. Do you remember those red and blue gas station slushies as a kid? Those are what this drink reminds me of, except a lot healthier! There are no artificial dyes, and I minimized the sugar in this recipe. I used frozen strawberries to get the cold slushie effect, but feel free to add in some fresh strawberries if you have some you need to use up! The lemonade part is very easy to make with only three ingredients: fresh lemon, water and sugar. This is the perfect drink for a warm day! I also like to make them for seasonal parties since they look oh-so-fancy. Bring water to a boil in a small pot, then add the lemon zest, lemon juice and sugar. Stir until sugar is dissolved, then remove from heat and cool to room temperature. Add the strawberries and lemonade to Magic Bullet cup or pitcher and blend. Garnish with fresh strawberries and lemon wedges. Happy Mother’s Day! Whether you’re making this yourself or want to surprise the special woman in your life, this recipe is an easy and absolutely delicious way to start the day! Ever since smoothie bowls arrived on the scene, I rarely make plain smoothies anymore. Bowls are so much more fun! Maybe it’s because of all of the yummy toppings you can add. This smoothie bowl is made with peaches and raspberries, and, as with all smoothie bowls, I used frozen banana to thicken it up. Coconut, chia seeds, and fresh fruit are fail-proof toppings for all smoothie bowls, and make a great topping choice for this raspberry peach smoothie bowl. It makes the perfect breakfast or dessert! Add the banana, peach, frozen raspberries, orange juice, and yogurt to a Magic Bullet cup and blend. Add more water if needed to get it going. Pour the smoothie into a bowl and top with chia seeds, coconut and fresh raspberries, or Mom’s favorite toppings! This recipe is natural, decadent and delicious. A strawberry daiquiri on its own is a force to be reckoned with: a fresh strawberry smoothie with alcohol? Yes please! Combine that with slightly whipped coconut cream, though, and you’re in a different league of tasty. With the Magic Bullet’s help, we’re not only blending the daiquiri, we’re creating powdered sugar and whipping our own coconut cream. * Most recipes call for powdered sugar. 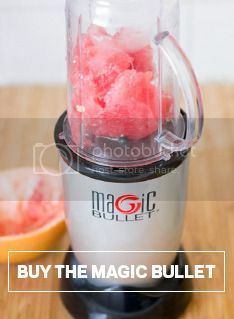 Instead of buying an entire package, we’re going to use the Magic Bullet to powder plain sugar for us. First step is to make your own simple syrup. If you already have some, you can skip down to step 2. In order to make simple syrup, just combine 1 1/2 Tbsp sugar with 1 1/2 Tbsp water, heat and stir until the sugar is dissolved into the water. Now, let’s make our own whipped cream. Blend 2 Tbsp sugar in the Magic Bullet to powder. Scoop thick layer of coconut cream from the top of the can into the Magic Bullet. Discard the coconut water or save for other uses, and blend for 30 seconds. Then add vanilla and 1 Tbsp powdered sugar and blend for about 2 minutes (we don’t want it too creamy, so that the cream can mix well with our daiquiri). Chop strawberries into small chunks. Combine strawberries, ice, simple syrup, rum and vodka (or schnapps if you have it) in Magic Bullet and blend. Pour the strawberry mixture into your serving cup and top with the whipped coconut cream. Garnish with cinnamon if you’d like and enjoy the decadence of this wonderful drink – you deserve it! Being the mom of three very girly dramatic divas, I can attest that the color of food has a big play on whether they are willing to try certain foods or not. They even have an opinion on the color of the corresponding plate, spoon, bowl, cup, and everything else, for that matter. I love them so much, but, sometimes, it’s hard finding ways to make things appealing to those big, princess eyes of theirs. Recently, all the rave has been over acai and pitaya bowls. If you aren’t familiar with them, it’s basically a rich, antioxidant fruit blended into a thick smoothie topped with granola, fruit, and honey. It’s highly addicting! Pitaya, also known as dragon fruit, can be bright pink in color, which, to the eye of a 3-year-old tiara wearer, is amazing! This recipe can be an easy-to-make smoothie or turned into a bowl topped with granola, honey, and bananas. In your Magic Bullet, add all of your smoothie ingredients. Blend until bright, pink, and creamy! Pour in a cup and sip away, or top with desired toppings and eat with a spoon. Let’s face it: there are times when we all need a shot of something to perk us up. Whether that’s coffee, an energy drink or even a soda, our bodies sometimes just need a little push to get through an especially long day. For me, those moments occasionally coincide with a craving for something healthy and natural. With help from my Magic Bullet, I was able to make all natural energy shots, created entirely with nutrient-packed fruit. They pick you up, they’re delicious, and they come with the added bonus of being delightfully good for your body! Give this a try or sub any fruit with your favorite. Pineapple, mango, and strawberries make another delicious blend. Roughly chop the apple, add to Magic Bullet, and blend. Set aside once blended. Combine pear, apple and blueberries in Magic Bullet and blend thoroughly. Add a bit of water if you want the consistency to be a little thinner. Seal up the leftovers and store them in your refrigerator for later! And get creative! Add a mint leaf or sprinkle of cinnamon for added flavor and benefits! Greens go down easy when they’re this tasty! Simple to make and absolutely delicious, you’ll have no reason not to eat your greens. This recipe is perfect for the whole family. If you’ve got a picky eater, add a bit of all natural, raw, organic honey for a hint of sweetness. You can also tell your little one they’re drinking a Green Monster Blast or Hulk Smash for extra strength! Add all ingredients to your Tall Cup or Party Mug and blend until smooth. In celebration of all things green today, I made this green grasshopper smoothie. Don’t worry, it doesn’t contain any real grasshoppers! It is inspired by grasshopper desserts, which usually contain mint and chocolate. This healthy smoothie is loaded with spinach, banana, almond milk, mint extract, and cacao nibs. It is really refreshing when cold, so I like to freeze my bananas beforehand and use a handful of frozen spinach straight from the freezer. Fresh mint leaves add a nice touch of decoration, and go perfectly when blended in this grasshopper smoothie for an extra minty taste. Add the banana, almond milk, spinach, cacao nibs and peppermint extract to a Magic Bullet cup and blend well. Top with fresh mint leaves and cacao nibs for extra flavor.